Though they were both No:1 superstars throughout the 1980s and 1990s, Sridevi did just three films with the legend, Amitabh Bachchan. Inquilab (1984), Aakhri Raasta (1986) and finally, the best of the lot, Khuda Gawah (1992). UPDATE: And in 2012, Amitabh Bachchan did a guest appearance in Sridevi's fabulous English Vinglish. We live in perpetual hope that the two legends of Indian cinema will reunite again on screen. FB 989 - 29 YEARS of my film 'AAKHRI RAASTA' .. what times and what story concept by Bhagyaraja .. how time has flown by .. This was the best film with Big B and gorgeous Sri! rekha has dubbed for sridevi in this movie why did sridevi not duub herself? There is a lot of history behind why Amitabh and sride did not do more films. But First of all in the above poctures the one with Sridevi in Red Shorts is a song from movie Sarfarosh with Jeetendra which was a remake of sri and NTR which was a super hit in Telugu but bombed in hindi because Jeetu is not NTR in double role. Sridevi is a time time Bomb and dynamic in Song and dance numbersand very yoing in 80's. NTR and ANR who used to act rona Dhona Dramas with Savitri etc had revived their careers by learning to do Song and Dance numbers with Sridevi. So did Jeetendra.Even in flop Film the Parts Sridevi was in was always a hit. Sridevi's voice even in Telugu I hve noticed diction Faults but very minimal, but when it came to Hindi films , first Baby Naaz's Voice was dubbed in Himmatwala to give time for Sridevi to master Hindi and also her body in Song and dance numbers was very strong.and sensual and for Hindi audience sridevi was too strong for a newcomer. They did not know Sridevi was #1 Top Heroine in Telugu and Tmil and was giving all Hroes arun for their money with her Song and dance Numbers. Movies with dubbed voice by Naaz were hits but when sridevi dubbed for Akalmand and Inquilab were flops because many reasons aincluding her diction in voice in Hindi. 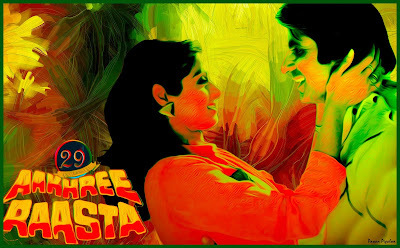 Aakhri Raasta came and sridevi was beyong pissed off that her voice was dubbed none other than Rekhs for the audince who were in Love with Amitabh and Rekha combo.She also realised that there was not much to to do in Amitabh Movies. She was # 1 and strong and her forte was Song and dance numbers. Amitabh at that time made the mistake of going into Politics and to make it Hit with sridevi needed to do song and dance numbers which he was not used as an =AngryMan dishum Dhum roles and also running around with sridevi did not suit his Public Image as a Politician. he completed some scenes except for song and Fance numbers and got sick on top of it ,went to LA for treatment of myasthenia gravis. 3 factors on amitabh's part 1. changing geras to dance with Stidevi just like ANR and NTR9 he knows even today he made a mistake), 2. joining politics, 3 Health, 4 Sridevi was not just a Gig in HIS movies like the beleif of Amitabh and Prakash Mehra what more do you want for a Film?5. Sridevi was too strong . "Sridevi has a knack of stealing the wits and Thunder right under the hero with her moves watch out" quote Chiranjeevi in his Interview od 25 yrs of JVA Sundari.So it was actuallu amitabh's fault and now he advises heroes not to take a break for being a hero.You loose groud. 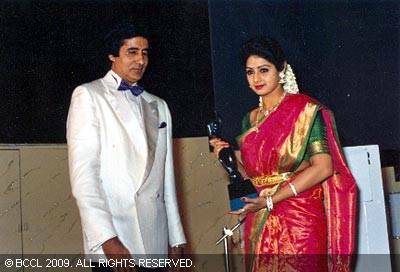 Amitabh and Jeetu did a lot of flop films with other heroins and they know in their Hearts the Value of Sridevi. Like Hum Kimi katkar role sridevi rejected. but for London Live Jumma Chumma show he had to rope in Sridevi with all her Chandni fame for success of the show ans she obliged him by doing Jumma Chumma Live. So Amitabh sent truckloads of Flowers etc to make Sridevi say yes to Khuda Gawahand she agreed because of double role. times had changed where Amitabh did double and tripple ( Mahaan) roles.It is Sridevi and even now after 15yrs with English Vinglish, Sridevi is a Hot sensuous Heroine. The queen and the Last Empress of India Cinema. Looking forward to her role as Puli. This was my response on Sridevi's biggest blog. I am (the only one to my knowledge who is a South Indian with Knowledge of all 4 south Telugu, Tamil, kannada and Malyalam Languages and lived in north with full Knowledge of hindi Films ) a Sridei fan who knows all Sridevi songs in all laguages and dresses by heart. First you posted a picture of Sridevi in Red shorts saying it was Sridevi in 80's in Aakhri Raasta. No. It is a still from a song called "Sridevi" by Jeetendra in Movie Surfarosh,remake of Sri and NTR which was a super hit in Telugu but bombed in Hindi because Jeetu is not NTR in double role. 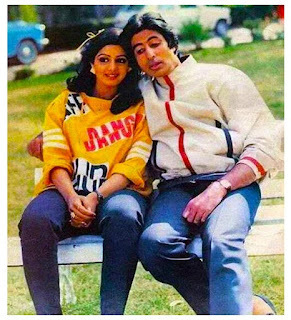 There is a lot of history behind why Amitabh and Sridevi did not do more films together inspite of the fact that they both were #1 in 80's and 90's. Sridevi was and is a time Bomb and Dynamic in Song and dance numbers and very young in 80's. NTR and ANR who used to Act Rona Dhona Dramas with Savitri etc had revived their careers by learning to do Song and Dance numbers with Sridevi. So did Jeetendra. Even in flop films the Parts Sridevi was in was always a Hit. Sridevi's voice even in Telugu I have noticed diction Faults but very minimal, but when it came to Hindi films , first Baby Naaz's Voice was dubbed in Himmatwala to give time for Sridevi to master Hindi and also her body in Song and dance numbers was very strong.and sensual and for Hindi audience Sridevi was too strong for a newcomer. They did not know Sridevi was already #1 Top Heroine in Telugu and Tmil and was giving all Hroes a run for their money with her Song and Dance Numbers. Movies with dubbed voice by Naaz were Hits but when Sridevi dubbed for Akalmand and Inquilab were flops because of many reasons including her diction in voice in Hindi. Aakhri Raasta came and Sridevi was beyond pissed off that her voice was dubbed none other than Rekha for the audience who were in Love with Amitabh and Rekha combo. Sridevi also realised that there was not much to do in Amitabh Movies. She was # 1 and strong and her forte was Song and Dance numbers. Amitabh at that time made the mistake of going into Politics and to make Hits,He needed to do song and dance numbers which he was not used as an AngryMan Dishum Dishum roles and also running around with Sridevi in songs did not suit his Public Image as a Politician. He completed scenes in Khabardar, except for song and dance numbers and got sick on top of it ,went to LA for treatment of myasthenia gravis. 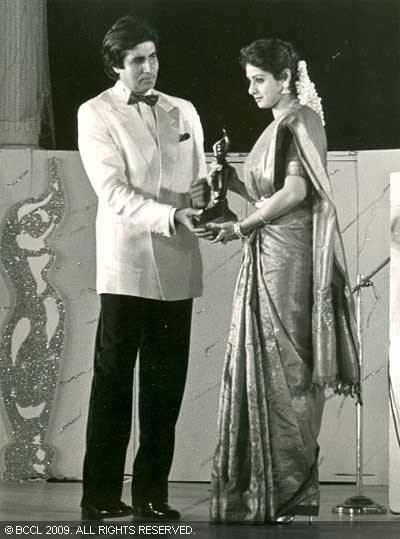 1. changing geaas to dance with Sridevi just like ANR and NTR ,He knows even today he made a mistake, 2. Joining politics 3 Health 4 Sridevi was not just a Gig in HIS movies like the belief of Amitabh and Prakash Mehra what more do you want for a Film? 5. Sridevi was too strong . "Sridevi has a knack of stealing the Wits and Thunder right under the Hero with her moves watch out" Quote Chiranjeevi in his Interview of 25 yrs of Jagadeka Veerudu Atiloka Sundari. So it was actually Amitabh's fault and now he advises heroes not to take a break from being a Hero.You loose ground. Amitabh and Jeetu did a lot of flop films with other heroins and they know in their Hearts the Value of Sridevi. Like in Hum kimi katkar role Sridevi rejected. but for London Live Jumma Chumma show he had to rope in Sridevi with all her Chandni fame for success of the show and Sridevi obliged him by doing Jumma Chumma Live. So Amitabh sent Truckloads of Flowers etc to make Sridevi say yes to Khuda Gawah and she agreed because of her double role. 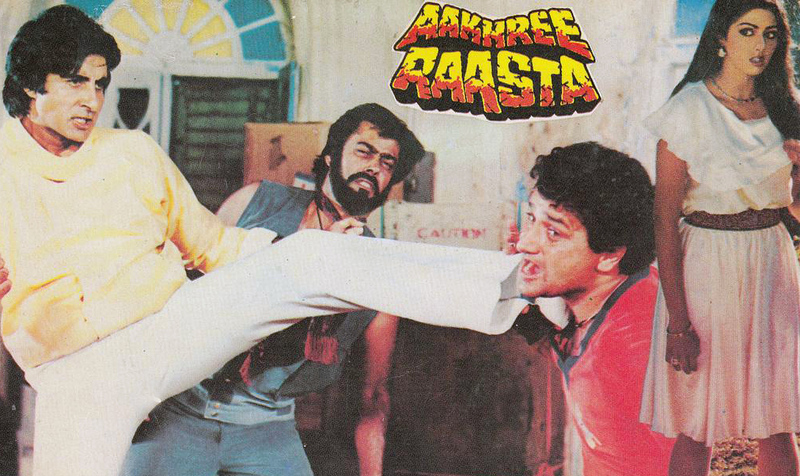 Times had changed where Amitabh did double and tripple ( Mahaan) roles. I told Sridevi in person 1987 in Washinton D C Show with Jeetendra, that Sridevi is bigger than Amitab )with due respect to #1 Hero). It is Sridevi and even now after 15yrs with English Vinglish, Sridevi is a Hot sensuous Heroine. The Queen and the Last Empress of Indian Cinema. Looking forward to her role as Puli. I am a South Indian with Knowledge of all 4 south Telugu, Tamil, kannada and Malyalam Languages and lived in north with full Knowledge of hindi Films ) a Sridei fan who knows all Sridevi songs in all laguages and dresses by heart. First you posted a picture of Sridevi in Red shorts saying it was Sridevi in 80's in Aakhri Raasta. No. It is a still from a song called "Sridevi" by Jeetendra in Movie Surfarosh,remake of Sri and NTR which was a super hit in Telugu but bombed in Hindi because Jeetu is not NTR in double role. There is a lot of history behind why Amitabh and Sridevi did not do more films together inspite of the fact that they both were #1 in 80's and 90's. Sridevi was and is a time Bomb and Dynamic in Song and dance numbers and very young in 80's. NTR and ANR who used to Act Rona Dhona Dramas with Savitri etc had revived their careers by learning to do Song and Dance numbers with Sridevi. So did Jeetendra. Even in flop films the Parts Sridevi was in was always a Hit. Sridevi's voice even in Telugu I have noticed diction Faults but very minimal, but when it came to Hindi films , first Baby Naaz's Voice was dubbed in Himmatwala to give time for Sridevi to master Hindi and also her body in Song and dance numbers was very strong.and sensual and for Hindi audience Sridevi was too strong for a newcomer. They did not know Sridevi was already #1 Top Heroine in Telugu and Tmil and was giving all Hroes a run for their money with her Song and Dance Numbers. Movies with dubbed voice by Naaz were Hits but when Sridevi dubbed for Akalmand and Inquilab were flops because of many reasons including her diction in voice in Hindi. Aakhri Raasta came and Sridevi was beyond pissed off that her voice was dubbed none other than Rekha for the audience who were in Love with Amitabh and Rekha combo. Sridevi also realised that there was not much to do in Amitabh Movies. She was # 1 and strong and her forte was Song and Dance numbers. Amitabh at that time made the mistake of going into Politics and to make Hits,He needed to do song and dance numbers which he was not used as an AngryMan Dishum Dishum roles and also running around with Sridevi in songs did not suit his Public Image as a Politician. He completed scenes in Khabardar, except for song and dance numbers and got sick on top of it ,went to LA for treatment of myasthenia gravis. 1. changing geaas to dance with Sridevi just like ANR and NTR ,He knows even today he made a mistake, 2. Joining politics 3 Health 4 Sridevi was not just a Gig in HIS movies like the belief of Amitabh and Prakash Mehra what more do you want for a Film? 5. Sridevi was too strong . "Sridevi has a knack of stealing the Wits and Thunder right under the Hero with her moves watch out" Quote Chiranjeevi in his Interview of 25 yrs of Jagadeka Veerudu Atiloka Sundari. So it was actually Amitabh's fault and now he advises heroes not to take a break from being a Hero.You loose ground. 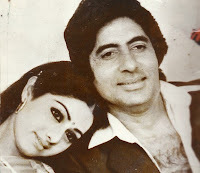 Amitabh and Jeetu did a lot of flop films with other heroins and they know in their Hearts the Value of Sridevi. Like in Hum kimi katkar role Sridevi rejected. but for London Live Jumma Chumma show he had to rope in Sridevi with all her Chandni fame for success of the show and Sridevi obliged him by doing Jumma Chumma Live. So Amitabh sent Truckloads of Flowers etc to make Sridevi say yes to Khuda Gawah and she agreed because of her double role. Times had changed where Amitabh did double and tripple ( Mahaan) roles. I told Sridevi in person 1987 in Washinton D C Show with Jeetendra, that Sridevi is bigger than Amitab )with due respect to #1 Hero). It is Sridevi and even now after 15yrs with English Vinglish, Sridevi is a Hot sensuous Heroine. The Queen and the Last Empress of Indian Cinema. Looking forward to her role as Puli.